True love really does conqueror all in Beethoven’s only opera, one of the most insightful and humane dramas in the repertoire. 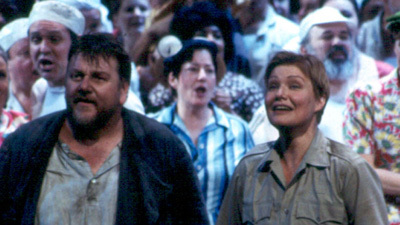 Waltraud Meier is Leonore, the young woman who disguises herself as a man to search for her wrongly imprisoned husband, Florestan (Johan Botha). With the help of the jailer Rocco (Matti Salminen) she succeeds in foiling the plans of the evil governor Don Pizarro (Richard Paul Fink)—though it almost costs her her life.